On this website we previously covered the excellent BBC documentary Fighting For Air. At the end of the programme, viewers were informed they could use an air quality postcode checker, enabling anyone in the UK to see how their area faired on a simple scale of 1 – 6. However, we delved into this for some areas of Bristol already covered by local council monitoring and were not convinced by the results. The checker considers only one of the 9 standards that apply to these 5 pollutants. This is the NO2 annual average, on a scale of 1 – 6. Where 6 is equal to an annual average NO2 concentration of 100µg/m3 or greater. This is slightly bizarre as any residential façade that exceeds 40µg/m3 is in breach of EU law. The road featured in the documentary had an annual average NO2 of just over 40µg/m3. As mentioned, this is the legal threshold that applies at the windows of people’s houses. 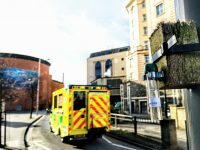 This level was clearly deemed necessary for action in the programme, yet some Bristol Streets with the same result are deemed to have “Good” air quality – a rating of only 1 out of 6. 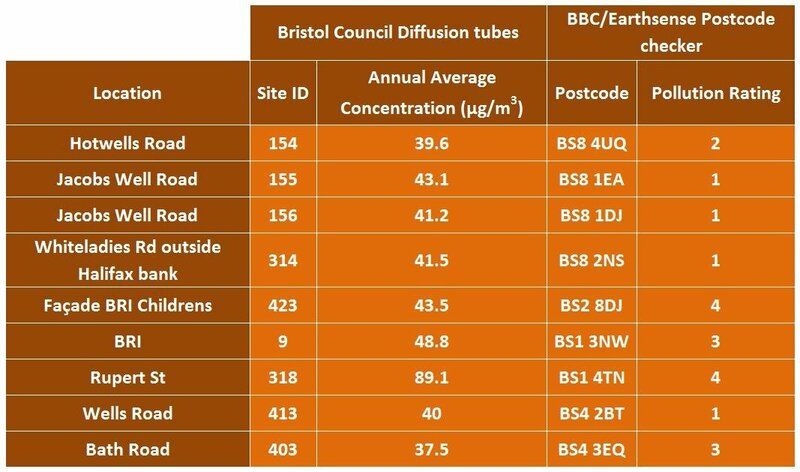 Overall, the checker does not correlate with Bristol Councils monitoring results and it only refers to one of a host of pollutants that are part of the problem in Bristol. Scientists knowledge of the impact of Air Pollution has on health is still in its infancy. Monitoring sites are few and far between and the technology for undertaking this is lacking. To pretend we have enough information to provide the public with a ‘one score’ ranking is misleading and hugely damaging to efforts of organisations such as Bristol Cycling, who are trying hard to raise awareness of the potential dangers of the current situation. It is also at odds with the precautionary principle. We would point anyone in Bristol who wants an understanding of NO2 outside their house, to visit the council map mentioned above and select an Air Quality monitoring site on a road with similar traffic flows to theirs. Other pollutants can only be guessed at as monitoring is almost non existent. Bristol, is one of the largest Air Quality Management Areas (AQMAs) in the UK, for Nitrogen Dioxide (NO2) and Particulate Matter <10µm (PM10). This means across the city pollutant concentrations of these have been breaching the National Air Quality Objectives (NAQOs), which are the government/EU target “safe” figures, across the city. These objectives cover 14 different pollutants. Of these, 6 apply to Bristol. These are listed here. NOx – the precursor to NO2 that is emitted directly from combustion. Not in itself harmful to humans, but exacerbates eutrophication, which is the burden from excess nutrients on environments. The NAQO for ecologically sensitive areas (defined on this map) is an annual average concentration less than 30µg/m3. NO2 – NOx released by vehicles/gas boilers and other combustion sources reacts with sunlight/ozone and VOCs to form NO, NO2 and NO3. NO2 is harmful to human health. The NAQOs require annual average concentrations to be less than 40µg/m3 and hourly average concentrations should not exceed 200µg/m3 more than 18 times per year. PM10 – Particulates measuring less than 10µm. Bristol is an AQMA for PM10 meaning it has high levels. There is only one PM10 monitoring station in the city, so citywide levels are largely unknown. The NAQOs for PM10 is annual average concentrations less than 40µg/m3 and 24 hourly averages not to exceed 50µg/m3 more than 35 times a year. PM2.5 – Particulates less than 2.5µm. These particulates, when breathed into the lungs, are able to dissolve into the blood stream. Their impact on our health has not been researched extensively and is poorly understood. The World Health Organisation (WHO) maintain that there is no safe level of PM10 and PM2.5 pollution. The UK NAQO is for annual average concentrations to be lower than 20µg/m3. A recent addition is a target to reduce concentrations 15% by 2020, an almost impossible achievement given that PM2.5 monitoring is almost non existent in the UK. Benzo(a)pyrene (BaP) – is released as a result of incomplete combustion, primarily wood smoke in urban areas. BaP falls under the Polycyclic Aromatic Hydrocarbon (PAH) family. It is a proven carcinogen. Annual Average concentrations should be less than 0.25ng/m3. Ozone – control of nitrogen oxides (NOX) emissions in the UK has led to an increase in ozone in urban areas. The NAQO is for an 8 hour average of 100µg/m3 not to be exceeded more than 10 times a year.